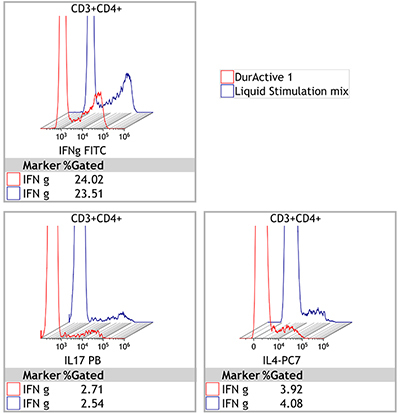 Dry Stimulation Mixes for Immune Functional Assays. Phorbol-Myristate-acetate (PMA) and Ionomycin are broad cellular activators of human leukocytes. Brefeldin A blocks Golgi-apparatus-mediated secretion. A mix of these 3 compounds strongly activates leukocytes and traps newly synthesized biomolecules (e.g. cytokines) inside the cell, hence it can serve e.g. as positive control for leukocyte (ligand-specific) functional assays and as a nonspecific activator in leukocyte functional subtyping experiments. The DurActive stimulation kits contain optimally dosed physiologically active compounds provided as unitized single tests in 12x75 mm tube format.